I've traveled to the Mideast several times, but one trip stands out, and not just because I experienced a 7.8 earthquake next to the Blue Mosque! “What IS that?” my guide at the Omayyad Mosque asked. "I thought it was a cross...but now I see it's something different," he continued. In response to his question, I showed him the two pendants I wore on a single gold chain around my neck. I was traveling in order to practice the Arabic I'd been studying at the University Of Minnesota. I was traveling in Turkey, Lebanon, Syria, Jordan, and Egypt: mostly Islamic countries. I thought my any conversations on spiritual matters would be subtle. I was very surprised to find out--it was not subtle AT ALL! In every country I went to, and most cities, people asked me about my religion, and it made for some very rewarding travel. On August 17, 1999, I was in Istanbul in a nightclub talking to a young Kurdish man. The pendants I wore were an Eckankar pendant that is a golden rectangle with a beautiful engraved six-pointed star representing the the highest state of consciousness, and a path leading into Its heart. My other pendant is a golden raptor with a small emerald in its heart, its wings spread for flight. 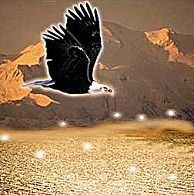 I call it my Eagle Of ECK (another name for the Holy Spirit) because for me it represents the independence of Trust in God, fearlessness, the soaring of Soul, the assuredness of a spiritual warrior. I wore the two together on my trip. The young Kurdish man in the nightclub had a tremendous sweetness about him, and a nuttiness too, singing the same Eagles song for hours. In between verses of "Hotel California" we talked about our love for our mothers (mine translated about a year and a half ago; his was in Eastern Turkey and he missed her). We also talked about God. I shared HU with him, and right before me, I saw his heart open wider and wider as he sang HU with me. I was still with Murat when the big earthquake happened. It was 7.8 on the Richter scale. We were in a taxi en route to the tea garden next to the Blue Mosque (pictured at left). We felt some shaking and lurching but were completely unaware that it had been a major quake until we got to the tea garden and saw how upset the waiters were; they told Murat what had just happened. All we saw were the glorious stars made more brilliant by the power outage. Spirit had caused our timing to be just so: we were safe. We sat in the tea garden drinking apple tea, singing HU as the residents and hotel guests began to swarm the area all around the Blue Mosque (pictured above), Hagia Sophia (pictured below), the Hippodrome, and all the surrounding gardens. It was a rude hour for them to be awakened: 3 AM. I was grateful that I had not been jolted awake. And Murat occasionally continued his Eagles song. 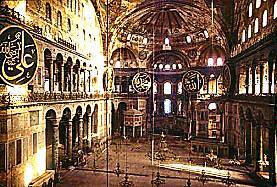 The whole neighborhood, the Sultanahmet area, was spared the heavy damage seen elsewhere in Istanbul. The next night, I flew to Lebanon, and through another wondrous gift from Sugmad (it's another story! ), was united with friends of friends from my home city of Minneapolis.Not 10 minutes after I arrived at their Beirut apartment, we were in a discussion about Eckankar, my hosts enthusiastically asking me questions. I was laughing as I answered because I was surprised at the immediacy and depth of our conversation. I knew I would have a good time with these new, old friends. The next week, in a Damascus post office, I met a Belgian student. He was traveling alone for a couple of days and would meet up with his companion in another Syrian city later. So we decided to travel together to Homs to visit the Crac Des Chevalier (pictured at right), an intact Crusader castle we both wanted to see. In retrospect, it is sometimes hard to remember exactly how or why the subject of Eckankar comes up, but come up it does, and my Belgian friend HU'd with me too. 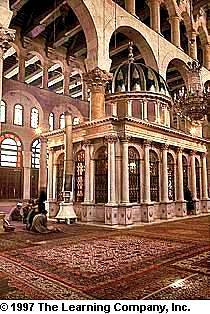 Days later, back in Damascus, I went to the Omayyad Mosque. A man in the ticket office offered to guide me through it and I accepted. At one point in the tour, he said seemingly out of the blue, "I am a Christian, like you." I said, "but I am not a Christian." "Do you want to know how I pray?" "Very much", he said gently, with a smile. "I sit quietly...I close my eyes...I think of a loved one, and focus my attention in an upward direction....and I sing, HUUUU...like that. I sing a few times. HUUUU .....HUUUU...." He joined me. "And then I listen for God." He gasped. "What does it sound like? A voice?" "Sometimes, but it can sound like rain, or a flute, or wind, or any of God's sounds" I said. We HU'd together a little more. Some weeks later, I found myself on a camel at Giza, riding around the Pyramids. My Egyptian guide here was riding a horse. He said to me "We will ride up behind the Pyramids, and there, you can make meditate." "Now after I sing, I must be quiet, to listen to Allah." "I understand," he said. I closed my eyes again and softly sang HUUUU....and I heard him singing with me. After a few times, I fell into my silent contemplation; when I opened my eyes, his big brown eyes were softer and shinier as I'm sure my own were. Most of the time that I spoke of ECK, I was speaking in English, but there was one place I was happy to discover I had enough Arabic to very simply describe how we pray in ECK. I was in a Cairo shop having some garments made. I was asked to wait for a fitting; in the meantime, two of the employees kept me company. After a few minutes of conversation, one of the men steered the conversation to religion. With his finger, he drew two short, crossing strokes across his wrist, and said in Arabic, "One of our workers is a Christian, did you see her cross?" "What religion are you?" I told him, "My religion is Eckankar." "I sit...like this..." I demonstrated singing HU, "then I listen to God." The second man understood completely and with a sweet smile, helped explain it to the first man. These are only a few of the experiences of sharing the Holy Spirit and the HU in the Middle East. I had gone there with the notion that my spiritual mission would be utterly subtle. Instead, it was completely obvious! People asked me all the time about my religion. I was concerned about causing offense (as religious talk can do) but the people I met were eager to sing HU with me.